It's all about the tutu for Serena Williams at the U.S. Open. Just days after French Tennis Federation President Bernard Giudicelli said her black catsuit with clot-preventing compression tights "will no longer be accepted," Williams chose a one-armed black tutu-style dress by Off-White's Virgil Abloh to take on Magda Linette at the Open. She won. Perhaps her sparkly shoes emblazoned with her name and "queen" also helped. On Wednesday night, playing against Carina Witthoeft, Williams was in another tutu dress that's part of her new collaboration with Nike and Abloh, who is also men's artistic director for Louis Vuitton. Anna Wintour looked pleased as she watched Williams beat Witthoeft. The Queen Collection is inspired by Williams' love of dance. She paired the black look with a leather biker jacket. The dresses have sheer panels on one shoulder and long sleeves on the other. Williams tugged hard on the sleeve as her Wednesday match began. 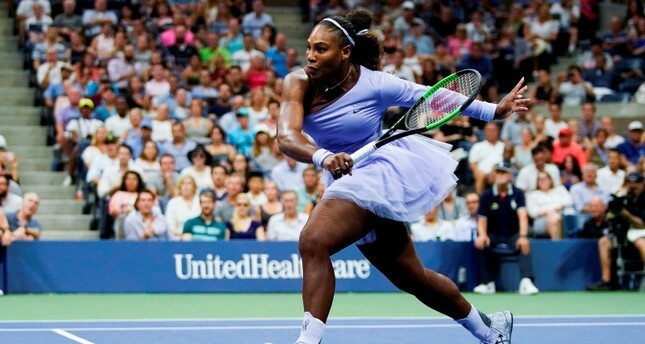 Serena's decision to wear a tutu come sin the wake of another controversy, a shirt-change sexism row which engulfed the U.S. Open on Wednesday. 28-year-old Alize Cornet was handed a code violation for "unsportsmanlike conduct" when she removed her shirt on court after realising she had put it on back-to-front while in the locker room during a 10-minute heat break in her first round defeat against Sweden's Johanna Larsson on Tuesday. Cornet, however, said she was happpy to accept the apology but called French tennis federation (FFT) president Bernard Giudicelli's ban on Williams' catsuit "10,000 worse" and genuinely worthy of being deemed "sexist". Many on social media were quick to point out that just a few hours after the Cornet incident, Wimbledon champion and two-time U.S. Open winner Novak Djokovic sat courtside on Arthur Ashe Stadium with his shirt removed and with an ice towel draped around his shoulders.